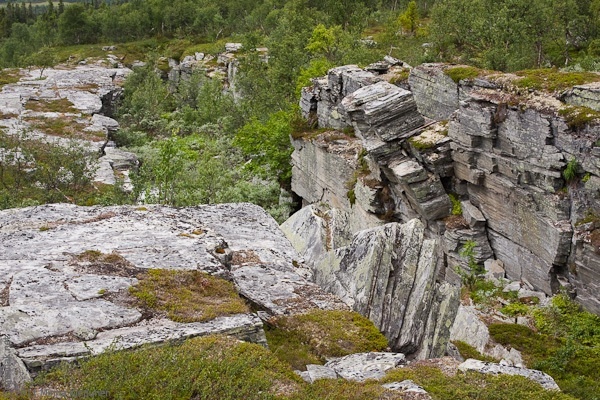 Svartmorgraven is located about 3.5 km west from Fiskhålsgraven on the southern slope of Flatruet. The Svartmorbäcken brook runs through the ravine and out to the Stassån creek. There are remains of an old lapp campground on both sides of the brook in the forest. 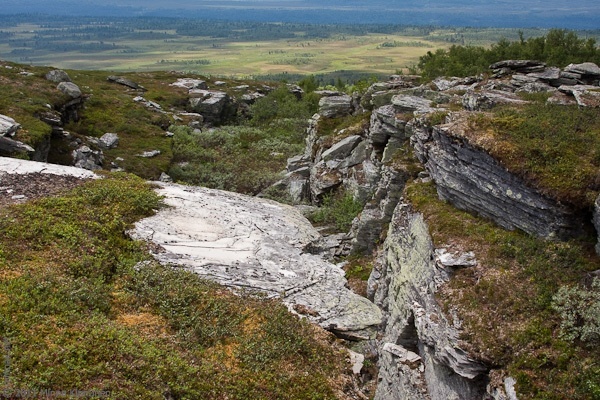 The name “Svartmor” comes from an old spruce copse rich with lichens, called “mor” or “granmor” in the Härjedalen dialect. Svartmorgraven is a hidden gem of a ravine. It is fairly easy to reach if you’re just prepared to walk the distance and it is well worth the effort. It is perhaps not as big and deep as Evagraven, but it has more character with some rock formations that will make you hold your breath because they look like they are defying gravity. Svartmorgraven is a personal favourite of mine and I think photographers in particular will enjoy thanks to all the intricate detail it has. If you’re interested in reading more about Svartmorgraven, check out my blog post about the ravine. Directions: Start from Ruvallen, you can first go to Fiskhålsgraven and go over it and then just walk westward keeping above the tree line. 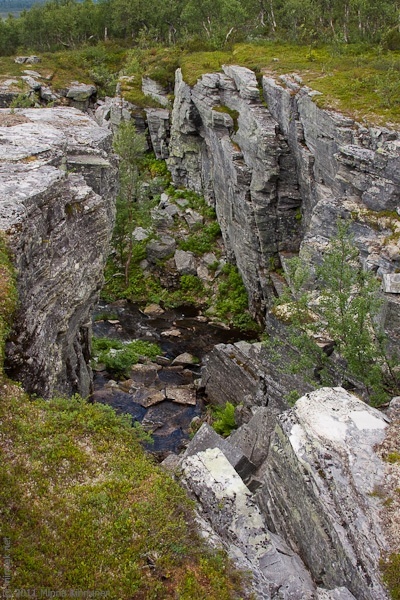 If you venture too far north, you will know it when you reach the brook which is lined with rocks and low cliffs. Then just follow the brook until it falls in the ravine. You can also reach it directly from the Messlingen village. First, turn up to Busks väg (the junction is right where the tarmac road turns to gravel). After a couple of km, you will have a power central on the left. Shortly after this, a road goes to left (Forellstigen) and in the same crossroads, Busks väg becomes Rödingstigen. There’s a small parking lot right after the crossing so you can leave your car here. About 150m ahead on Rödingstigen, a trail crosses the road. You can see the trail sign on the left hand side, it’s a summer trail (“sommarled”) marked for Storsjö and Fiskhålsgraven and this is the direction you’ll be going. The trail is really good and easy to follow, and after about 2 km you will get to “pusta ut” where the trail branches. The big trail goes left (the small one to the right takes to Fiskhålsgraven, it’s actually only a few hundred meters from here) so continue up on the big trail it until you get above the forest line. Now you need to leave the trail, just turn straight left (west) and walk on the alpine tundra until you get to the ravine! It’s really that easy, there’s only a couple of spots with a little bit of wetland which are easy to navigate through but otherwise the ground is as good as it gets, even without trails. Distance: 6 km one way, both from Rödingstigen or Ruvallen.